The showBusStop function is an entry point that will be called on the Entity form’s OnLoad event (I’ll show later how to bind the event to the showBusStop). 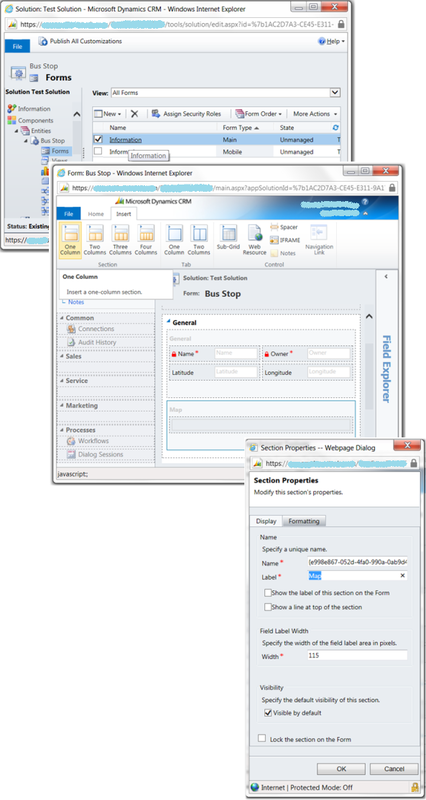 The showBusStop prepares the section for holding the map (how to add the section to the form will be described later as well) and dynamically includes the Bing Map script into the page by means of the addScript function described in details here – How to add a script-tag dynamically. 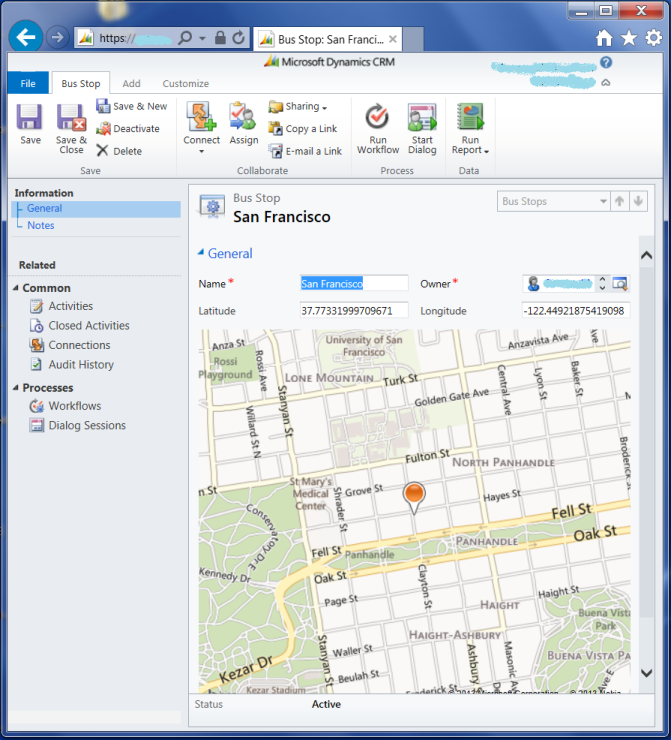 Once the Bing Map script has been loaded, we get the Latitude and Longitude and initiate Map Control creation by calling the loadMap function. Note that the Bing Map script dynamically includes other scripts, and one of those is responsible for Microsoft.Maps.Map definition. So, the loadMap waits until the Microsoft.Maps.Map gets available by recalling itself through the setTimeout. Once the Map Control has been created, we create a pushpin and add it to the map. The Map Control will adjust its width to fill the available space whenever the window’s size is changed. 2. Add a section to Entity form. For both steps the RetrieveMultiple is repeatedly called against the bulkdeleteoperation records. Firstly, we try to find a record, the asyncoperationid attribute of which equals the async job id received before. Once the record has been found, it means the Bulk Delete operation has been created. Secondly, then we wait for the Bulk Delete operation completion. The steps mentioned above have been implemented in the WaitForBulkDeleteCompletion method shown below. Like the WaitForAsyncJobCompletion, the WaitForBulkDeleteCompletion allows adjusting number of retries and sleep interval. It also analyses operation’s current state (and status) and provides actual progress on every iteration of the awaiting process. // Query for bulk delete operation and check for status. state.CurrentStatus         = createdBulkDeleteOperation.StatusCode != null ? Classes involved in the method are derived from the same base classes as those used for WaitForAsyncJobCompletion. 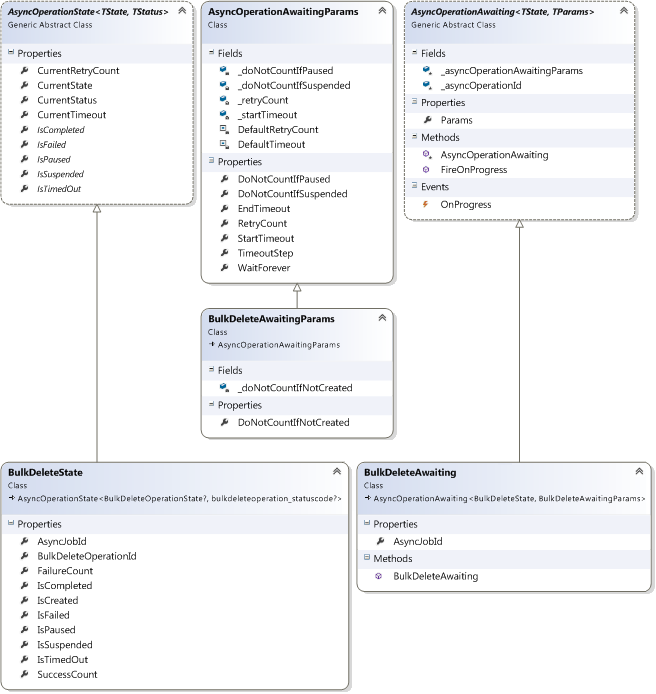 The diagram below demonstrates dependencies between the base classes and the ones specific for Bulk Delete operations. 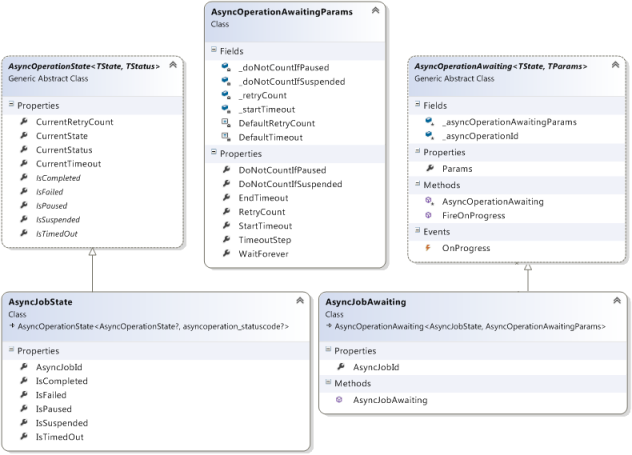 In comparison with the AsyncOperationAwaitingParams, I added one more property specifying whether retries are counted while Bulk Delete operation hasn’t been created yet. Note that the AsyncJobId here represents an auxiliary async job that is supposed to be associated with the target Bulk Delete operation. /// Id of the target Bulk Delete operation. Null when the operation isn't created. The class represents a current state of the Bulk Delete operation being awaited. The current state on each iteration is supplied by the WaitForBulkDeleteCompletion through the OnProgress event available in the passed BulkDeleteAwaiting instance. In the end the WaitForBulkDeleteCompletion method returns the final state. The bulkdeleteoperation_statuscode enum is defined in the OptionSets.cs at sdk\samplecode\cs\helpercode. This method is acceptable, but, as for me, it has some disadvantages. First of all, it’s better to have adjustable retryCount and sleep interval, so that to make them more suitable for each particular job. For example, if we know that an operation takes a very long time, we would extend the sleep interval and decrease max number of retries to minimize CPU time spent on checking of the job status. We could even make the waiting more adaptive and extend the sleep interval gradually: the more idle retries we have, the bigger the sleep interval gets. Secondly, the WaitForAsyncJobCompletion doesn’t analyze thoroughly the current state (and status) of the job. The job could be in Suspended or Paused state, in both cases, I think, it’s better not to count such retry as the job isn’t running at that moment. In addition, I would like to get some intermediate state on each iteration of the while-statement as it would allow tracing the job state changing in the time. state.CurrentStatus = asyncJob.StatusCode != null ? Note that the first thing I do in the while-statement is the sleeping for the current timeout value as I think It’s pointless to examine an async job for completion right after it has been created. As you can see, this implementation is still quite simple, however it depends on a few classes referred to as parameters of waiting and current state of the target job. The diagram below depicts these assistant classes and their dependencies. If you wonder why I use inheritance and produced so many classes for a simple async job awaiting I can just say in excuse of this that the base classes are employed for keeping track of other operations as well (e.g. Bulk Delete operations). The source code of the classes along with some explanations are shown below. I added the WaitForever option just in case. However, I recommend avoiding the use of it as it’s better to play with RetryCount and sleep timeouts (EndTimeout, TimeoutStep, StartTimeout) and find the most suitable values for them for each specific type of operations. /// Comprises the awaiting parameters and id of the operation to be tracked. /// Provides the OnProgress event supposed to be fired on each iteration of awaiting process. The descendants of the AsyncOperationAwaiting are supposed to supply parameters for more specific operations like async jobs, Bulk Deletes and so on. The AsyncJobAwaiting supplies the awaiting parameters for async jobs. An instance of the AsyncJobAwaiting class is passed to the WaitForAsyncJobCompletion method. The descendants of the AsyncOperationState are supposed to be states for more specific operations like async jobs, Bulk Deletes and so on. The class is marked as Serializable, it gives us an ability to persist the state somewhere like logs, databases etc. The class is a current state of the async job being tracked. The WaitForAsyncJobCompletion method returns the final state and provides the current state on each iteration through the OnProgress event available in the passed AsyncJobAwaiting instance. The asyncoperation_statuscode is defined in the OptionSets.cs that could be found at sdk\samplecode\cs\helpercode. The exception is thrown in the highlighted line. This code gets the ImportFiles, goes through them and fills the dictionary with ImportFile Ids, using the SourceEntityName as a key. Obviously, if we have at least two ImportFiles with the same SourceEntityName (my case), we get the exception. I was looking for a workaround and the first thought that came into my mind was to set different SourceEntityName for each ImportFile. However, SourceEntityName of ImportFile must coincide with the one specified in an associated ImportMap. 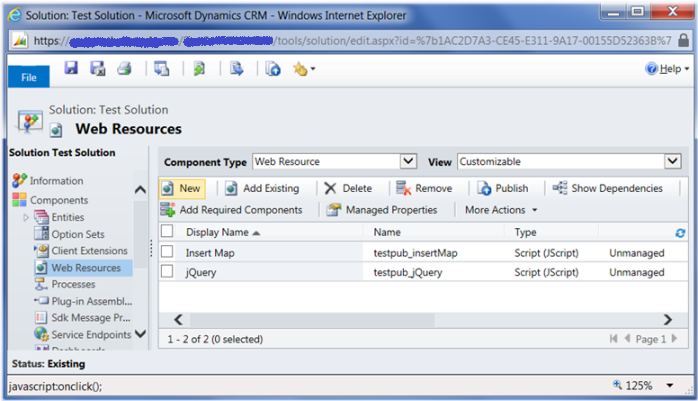 I had one ImportMap for all of ImportFiles as they supply records for one CRM Entity. So, following this way, I would have to provide with as many almost identical ImportMaps as many ImportFiles are to be uploaded. The difference between the ImportMaps would be only in the SourceEntityName attribute. I discarded this idea as it’s extremely not optimal. The approach I chose in the end is just to use an individual Import for every ImportFile. So, if you have a number of ImportFiles and each ImportFile is associated with a distinct ImportMap and supplies records for a distinct CRM Entity, you can combine them into one package (group under one Import instance). But if you are planning to import records from several ImportFiles to one and the same CRM Entity using one and the same ImportMap, use an individual package (separate Import instance) for every such file. 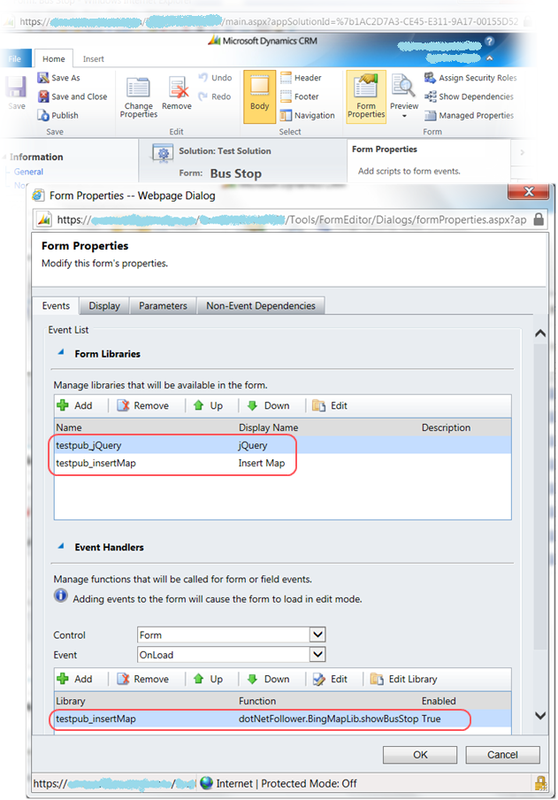 The fact that we are not able to import data from several files to a CRM Entity at once (i.e. using one Import package) is a very strange limitation for me. I hope this inconvenience will be fixed in upcoming CRM versions.